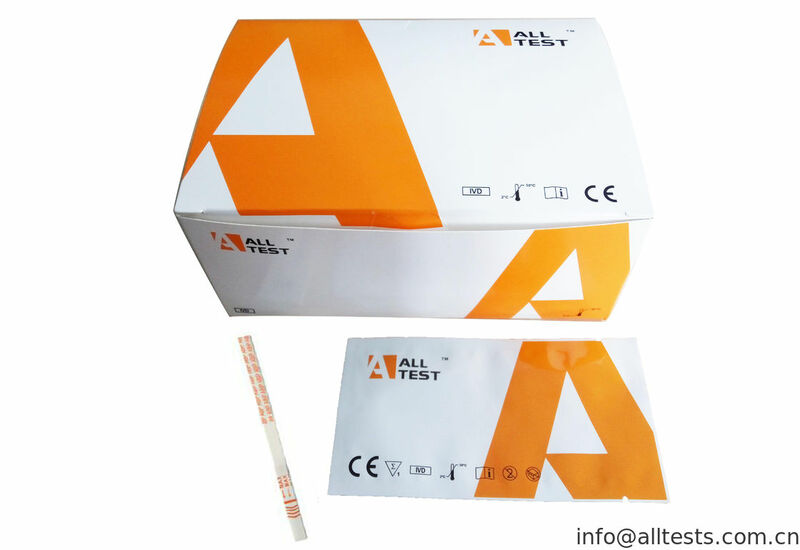 The MDPV Rapid Test Dipstick (Urine) is a rapid chromatographic immunoassay for the detection of 3, 4-methylenedioxypyrovalerone in human urine at a cut-off concentration of 1000ng/mL. 3, 4-methylenedioxypyrovalerone (MDPV) is a psychoactive recreational drug with stimulant properties which acts as a norepinephrine-dopamine reuptake inhibitor (NDRI). It was first developed in the 1960s by a team at Boehringer Ingelheim. 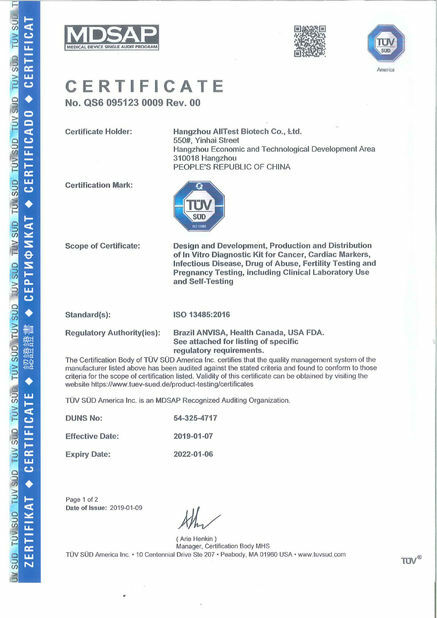 MDPV remained an obscure stimulant until around 2004 when it was reportedly sold as a designer drug. Products labeled as bath salts containing MDPV were previously sold as recreational drugs in gas stations and convenience stores in the United States, similar to the marketing for Spice and K2 as incense. 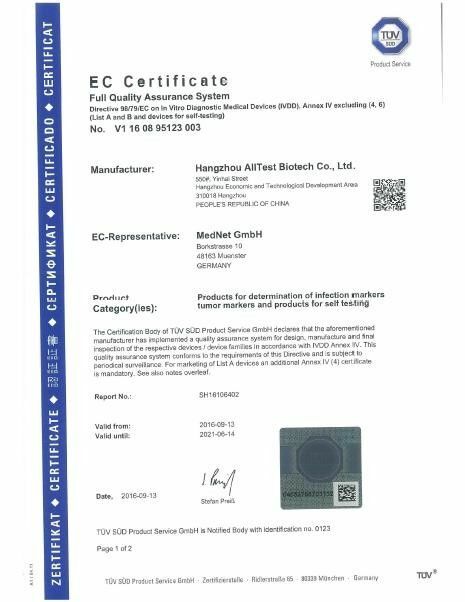 MDPV is the 3,4-methylenedioxy ring-substituted analog of the compound pyrovalerone, developed in the 1960s, which has been used for the treatment of chronic fatigue and as an anorectic, but caused problems of abuse and dependence. However, despite its structural similarity, the effects of MDPV bear little resemblance to other methylenedioxy phenylalkylamine derivatives such as 3,4-methylenedioxy-N-methylamphetamine (MDMA), instead producing primarily stimulant effects with only mild entactogenic qualities. The MDPV Rapid Test Dipstick (Urine) is a rapid urine screening test that can be performed without the use of an instrument. 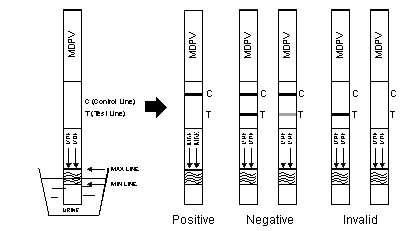 The test utilizes a monoclonal antibody to selectively detect elevated levels of 3,4-methylenedioxypyrovalerone in urine. The MDPV Rapid Test Dipstick (Urine) yields a positive result when 3,4-methylenedioxypyrovalerone in urine exceeds 1000ng/mL. Bring the pouch to room temperature before opening it. Remove the Test Dipstick from the sealed pouch and use it within one hour. With arrows pointing toward the urine specimen, immerse the Test Dipstick vertically in the urine specimen for at least 10-15 seconds. Do not pass the maximum line (MAX) on the Test Dipstick when immersing the strip. See the illustration below. 3.Place the Test Dipstick on a non-absorbent flat surface, start the timer and wait for the colored line(s) to appear. Read results at 5 minutes. Do not interpret the result after 10 minutes. NEGATIVE:* Two distinct colored lines appear. One colored line should be in the control line region (C), and another apparent colored line should be in the test line region (T). This negative result indicates that the 3, 4-methylenedioxypyrovalerone concentrations are below the detectable level (1000ng/mL). POSITIVE: One colored line appears in the control region (C). No line appears in the test line region (T). This positive result indicates that the 3, 4-methylenedioxypyrovalerone concentration exceeds the detectable level (1000ng/mL).